INTERVIEW: John P. Calverley, Chief Economist and Strategist of American Express Bank and author of Bubbles - And How to Survive Them (Nicholas Brealey Publishing, November 2004). 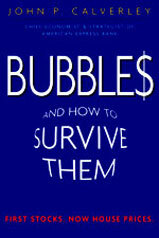 In this book, the author discusses economic bubbles and offers advice, from a global perspective, on how to survive them. Previously, Calverley wrote The Investors Guide to Economic Fundamentals (Wiley, 2002). John Calverley appears frequently on CNN, CNBC and the BBC. His areas of expertise include global economics, global market overview, U.S. economy, and Hong Kong, China. He lives in London. AVAILABILITY: New York, NY, Mon. Nov. 15 after 10:30 am est, Tu., Nov. 16 all day, Wed. Nov. 17 all day, Mon. Nov. 22 until 3:30 pm est, and Tu. Nov. 23, 2004 after 1:30 pm est. Nationwide by telephone. (New York, NY, Nov. 16, 2004) First stocks, now houses, what can be done about the dangers of financial bubbles? Historically, bubbles were unusual events. The most famous early speculative bubble was tulipmania in 17th century Holland which Charles Mackay wrote about in the classic Extraordinary Popular Delusions and the Madness of Crowds. But for the last 20 years, bubbles have become central to the economy according to John P. Calverley, Chief Economist and Strategist of American Express Bank. We must learn to live with bubbles, he says. Further, despite the irrational and unpredictable nature of bubbles, there are ways to both identify and survive bubbles. In his new book, Bubbles - And How to Survive Them, Calverley tells how. With the internet stock bubble of the 90s just behind us, and a housing bubble looming, Calverleys book could not be more timely. Calverleys book looks first at the Great Depression, then Japans bubble in the 80's, and finally at what he calls the Greenspan bubble. He asks if in the aftermath of the Internet stock bubble, we have not created a new bubble in housing, which leads him to an expansive discussion of housing prices worldwide. "The US seems to be in the early-to-middle stages of a housing bubble. The bubble in other countries, particularly the UK and Australia seems to be much more advanced. Rapid price rises and high valuations are always present, but a good test for a bubble is to look for other typical factors such as a relaxed monetary policy, rapid lending growth, a prolonged economic upswing, falling savings rates and large-scale media and popular interest. The housing bubble qualifies on all these criteria in some regions of the US, though not all are affected. The most bubbly areas are in Massachusetts, New York, New Jersey, Florida and California." Meanwhile investors need to find ways to protect themselves. Some may try to ride bubbles, exiting at the top, but market timing is always difficult and risky. A more balanced approach is to focus on avoiding their worst effects by holding a diverse portfolio and adjusting away from bubbling assets. On the occasion of the release of the book Bubbles - And How to Survive Them in the U.K, The Financial Times wrote: "... balanced and thoughtful...Calverley may have timed his call to perfection. And he deserves credit for doing so in such lucid and down-to-earth tones." "The [U.K.] housing market is currently in the 'mother of all bubbles' and prices could slump by 30% before the return to their long-term average, a leading economist has warned. John Calverley, chief economist at American Express Bank in London and author of a new book called Bubbles - And How to Survive Them, is the latest in a growing band of City gurus to warn that house prices, which have more than doubled in recent years, are poised for a sharp fall. Mr Calverley, who successfully predicted the housing market crash of the early 1990s argues in the book that modern economics are increasingly dominated by bubbles in asset prices, be they shares or houses." Published by Nicholas Brealey Publishing, North American Group, 100 City Hall Plaza, Boston, MA 02108. Q How can you be sure that the rise in house prices is really a bubble? A Overall the US seems to be in the early-to-middle stages of a housing bubble. The bubble in other countries, particularly the UK and Australia is much more advanced. The book provides a checklist for identifying bubbles (page 13). Rapid price rises and high valuations are always present, but a good test for a bubble is to look for other typical factors such as a relaxed monetary policy, rapid lending growth, a prolonged economic upswing, falling savings rates and large-scale media and popular interest. The housing bubble qualifies on all these criteria in some regions of the US, though not all are affected. Some of the most bubbly areas are in Massachusetts, New York, New Jersey, Florida and California. Q How can you be sure an asset is valued too high? A The book proposes broad ranges for stocks and houses, within which valuations can be seen as reasonable. For example a price-earnings ratio of between 10-20 and a house price-rental yield of 6-10% (i.e. the annual rent divided by the house price). If prices take these valuations above the range then we can start to say that it is probably a bubble. The book shows that these ranges are well-grounded both in past history and on an analysis of risk premiums. Realistically, we may not ever be able to identify a bubble with 100% certainty, but the further outside the range market valuations go and the more items ticked on the checklist (see above) the more likely that it is a bubble. Q Why are housing bubbles a threat? A At present Americans wealth is high in relation to income, despite the collapse of the stock bubble a few years back. This is largely because of the rise in value of housing. If the economy slows down for some reason, perhaps because of a slump in investment, or an outside shock or because monetary policy is tightened to head off inflation, there is a risk of a slump in house prices. This would reduce household wealth, hurt confidence and might severely complicate the downturn. Q The collapse of the stock bubble in 2001-2 had only a limited impact. Why should housing be any different? A The collapse in stocks only had a limited impact because it was offset by large cuts in interest rates and a huge fiscal stimulus. A new fiscal stimulus is not possible given the deficit levels today. And official interest rates are much lower than in 2000. Between 2000 and 2003 the Fed cut Fed funds rate from 6.5% to 1%. Today rates are only 1.75%. Moreover, the impact of the fall in stock prices was limited precisely because lower interest rates stimulated the housing bubbles, partly offsetting the loss of wealth in stocks and helped to keep consumer spending buoyant. Finally, it should be remembered that the stock bubble has left a legacy of problems for company pension schemes which have not gone away. Q Could house prices fall on their own? A spontaneous fall in house prices, leading to a slowdown in consumer spending and a weaker economy is certainly possible. The risk is greatest where house prices have reached extremes and where there has been substantial speculative activity, such as in the UK and Australia currently. US valuations are not yet so extreme. In practice, however, a fall in house prices is unlikely to be completely spontaneous. There is usually some sort of trigger, such as a rise in interest rates. But past experience with bubbles suggests that the trigger can often be something quite small. Q How much could house prices fall? A Based on past averages house prices could easily fall by 15-20% in the US on a nationwide basis but that would imply 20-30% falls in the most bubbly regions of the country. If accompanied by a severe economic downturn, a still-greater fall is possible. Q But US house prices have never fallen in the last 40 years. Why should they fall now? A The big difference with the past is that underlying consumer price inflation is much lower now. Taking out consumer price inflation, "real" house prices fell by 10% in the last housing downturn from 1990-95, but consumer price inflation of 3.3% pa, meant that nominal house prices moved up slightly. However, with inflation running at lower levels now, and house prices set to reach higher valuations than in 1990, there is a much greater chance of an outright fall in house prices. Moreover, if house prices fell in the context of a weaker economy, there is a risk of deflation (falling consumer prices) which would make the potential for lower house prices even greater. Q Why does a fall in house prices matter? A It obviously matters to individuals who have bought recently, since they will lose a large chunk, if not all of their equity. Some could find themselves with negative equity which, as well as being particularly painful, can make it difficult to move house. But it will also be of concern to people who bought some time ago, if they were relying on high and rising house prices to help fund their retirement. Q How does a fall in house price affect the economy? A the main effect is through a rise in the household savings rate as people save more and borrow less. So-called cash-out financing (or "mortgage equity withdrawal") has played an important role in sustaining consumer spending in recent years. Falling house prices would bring that to an end and the household savings rate would move up. The US household savings rate is currently only about 2%, which makes perfect sense given the strength of balance sheets. But strong balance sheets is reliant on house prices staying high. Higher savings rates mean slower growth of consumer spending, which accounts for around 70% of GDP. Q Surely the Fed would cut interest rates if house prices fell sharply? A Yes, provided they were not concerned that consumer price inflation was too high. The Fed might welcome the combination of lower house prices, lower interest rates and a lower exchange rate. This would help to rebalance the economy and make a start on reducing the current account deficit. Lower interest rates should help to cushion the downward move in house prices, but this cannot be guaranteed since, once bubbles go into reverse, there is a danger that sentiment completely reverses too and prices can undershoot on the downside, as was seen when the stock bubble burst in 2001-2. The Fed needs to get its response just right, or they may be unable to prevent a recession. Q What will happen to the US bubble? A Nationwide house prices rose 9.36% in the year to Q2, (Source OFHEO) the largest annual rise since the 1970s (when underlying consumer price inflation was much higher). The US bubble is likely to expand further in the near term, which will provide support for economic growth. Mortgage rates will only move up gradually and will remain relatively low for some time, since inflation is still well under control. Meanwhile economic growth will gradually bring down unemployment and raise wage growth. Areas where prices are already very high may slow or even pause, as affordability becomes a barrier, but other areas are likely to become expensive too. Q Is there anything the US authorities can do to slow the bubble? A Monetary policy could try to "lean against" the bubble by raising interest rates more than otherwise would be the case. But, since two-thirds of mortgages are linked to long-term bond yields, changing Federal Funds rate might not affect mortgage rates. Moreover as Mr Greenspan correctly argues, there is always a danger of precipitating the downturn that we are trying to avoid. More useful would be greater public warnings about the risks of buying property when values are expensive and, possibly, measures to reduce banks' appetites for mortgage lending. Again, this is difficult in the US, since most mortgages are now securitised. Q When will the bubble collapse? A One of the themes of the book is that bubbles are unpredictable, largely because they are NOT based on rational valuation behavior. Hence they often inflate for longer than seems likely and then crash unexpectedly. The near-term risk of falling house prices is relatively low in the US and is greater in the UK and Australia. But the risk of a combination of a large fall in house prices and a major economic downturn is not great in the near future because general consumer price inflation is still very moderate everywhere and central banks can therefore respond quickly with lower interest rates. But, looking ahead into H2 2005 and 2006, the risks increase, either because a modest fall in house prices suddenly "tips" the housing market over into a downward spiral, or because consumer price inflation re-emerges, reducing the Fed's freedom of manoeuver. Q Are there other countries in a housing bubble? A The UK and Australia already have major housing bubbles and the central banks there, the Bank of England and the Reserve Bank of Australia are watching very closely. The Governors of both have publicly warned about house prices, in Australia starting in 2003 and in the UK in June 2004. Holland, Spain and Ireland have all had huge increases in house prices, linked to the fall in interest rates caused by the introduction of the euro. These countries too are vulnerable to a major economic downturn. Some other countries have seen fast-rising prices in recent years, including Canada, France and Italy, as well as Hong Kong in the last year, but in these countries prices are rising from depressed levels and it is too early to describe them as in a bubble. Q Can central banks do anything about bubbles? A Monetary policy cannot be relied upon to prevent bubbles, because policy-makers have only one instrument, interest rates, and their primary target is consumer price inflation. But if the housing bubbles burst, interest rates may need to be cut sharply to deal with the consequences. Q What other suggestions do you have to deal with bubbles? A The book proposes the establishment of an Asset Valuation Committee, charged with advising investors and the government when assets move out of reasonable ranges e.g. a price-earnings multiple for stocks of 10-20 and a house price rental yield of 6-10%. This could help by discouraging buyers when prices become high. It could also be used to help the authorities decide when to consider other measures such as speed limits for bank lending. Such a committee would need to have some independent standing but could be part of the Federal Reserve. Q What are "speed limits" to bank lending? A The book suggests that the expansion of bubbles might be limited by measures to link the mandatory capital requirements or the provisioning for bad loans made by banks to the behavior of asset prices. So, for example, if house prices are thought to be in a bubble, the authorities could require higher capital or larger reserves to be held against new mortgage lending. Q What should homeowners in the US expect? A In the US home prices look set to continue rising for a while, as the combination of a growing economy and only gradual rises in interest rates support the market. Prices are already high in some regions, particularly on the coast, but prices elsewhere look set to keep rising. Q Are bubbles an opportunity or a threat to investors? A They can be an opportunity if the investor can ride the upswing and get out at the top. This is easier to do with stocks than with houses, but difficult with both in practice since it is always very difficult to know how far a bubble will go and when it will crash. Moreover bubbles often create over-optimism on investment returns, inadequate savings and over-concentration in the bubbling asset class. Q How should investors react to bubbles? A Investors need to try to diversify away from bubbling asset classes. As always they should hold a balanced portfolio with a range of asset classes including stocks, bonds and property. When a particular asset is bubbling they should reduce the weighting. Right now stocks look a better bet than housing for the medium term. We would appreciate hearing from you if you plan to run a mention or review. Clippings would also be appreciated, hard copy or e-clippings. Thank you.